Creating animations with SolidWorks can be both fun and challenging. With the capabilities and options that SolidWorks now supports, making animations of models can fell like walking through a maze. The book Creating Animations with SolidWorks is a self-study guide that attempts to teach readers how to navigate that maze to create animations with SolidWorks. SolidWorks Corp provided me with one copy of this book for the purpose of this review. This review is my own content without input of others. Even though some of the animation functions in SolidWorks seem intuitive to me, please know that I have a small amount of professional video editing and production experience. Most readers will not likely have this sort of background. There is a lot of complexity in the creation of animations with models. To inexperienced SolidWorks users, many functions can be missed, particularly when using physics. Creating Animation with SolidWorks covers animation functions in great detail. However, I feel that the flow of the book needs some improvement, as the tutorials are sometimes hard to follow and information is needlessly repeated. This is a big book with over 500 pages. It’s big for a reason. This books covers all three methods (called motion study types) for creating animations in SolidWorks. These are Animation, Basic Motion and SolidWorks Motion. Many users will only have access some of these, as license type determines the add-ins which are available. Chapter 1 is a general overview of the book itself and animations within SolidWorks. Chapters 2 through 5 cover animation basics. Chapters 6 through 8 go into detail about motion and animating parts. Chapters 9 through 14 cover Basic Motion and SolidWorks Motion. Chapters 15 through 18 cover advice on how to get best results when creating animations and editing video. Creating Animations with SolidWorks is available in the SolidWorks store for $89.95. It comes with a DVD that has all of the files for each exercise and case study, so there is no need to download them separately. Although I did get an error when I installed the package from the DVD, the files seemed to work fine. 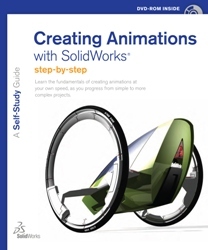 This book covers just about every topic necessary in the creation of animations with SolidWorks. In this, the book is very thorough. It is a step-by-step guide. I do not recommend starting at some point in the middle of the book. I also do not recommend using this book as a reference guide unless the reader is already fairly familiar with creating animations with SolidWorks. I found the formatting of the book to be harder to follow than the authors intended. For example, in the step-by-step SolidWorks exercises, the headings for each step seem more confusing than helpful, as they are often redundant or lack any useful information. My recommendation to the authors is that this book should list each step without the headings. This would improve space on the written page and likely reduce the size of the book itself while enhancing readability. Redundancy is common in this book in other ways. On page 6 there is a section entitled “Animations”. This section defines animation in the context of SolidWorks. Then, right on the next page (7), the reader encounters another section entitled “What is an Animation?”. Better organization of the topics will help reduce these redundancies. As mentioned, the step-by-step instructions are sometimes hard to follow. This is why I don’t recommend using this book as a reference guide. In an attempt to cover every detail about animation, this book includes many variations of similar tasks within each step-by-step exercise. This is good, right? Well, the problem is that it is not always clear when the reader should start a new series of steps or when to continue from the last step. I found several occasions in the step-by-step exercises where I could not continue because a task completed in the previous step was interfering with the very next task. The exercises should be better organized to let the reader know how to transition between different tasks. This book impressed me in one way. Creating any sort of video requires a bit of art. Creating Animations with SolidWorks actually provides very useful advise on the art to help the reader create animations with better results. This is somewhat outside the scope of a simple tutorial and adds a bit of value to the book. Overall, if someone is looking for a book that will self-teach them how to create animations in SolidWorks, this isn’t a bad book. It does cover practically every aspect necessary for that work. However, using this book may require a little patience. SolidWorks 2008 API Programming & Automation is recent self-published book by Luke Malpass, founder of AngelSix. (You will not find his book on Amazon.) Mr. Malpass wrote this book to fill an apparent gap in guide books about SolidWorks API. The last book that I know of written specifically on this topic was Automating SolidWorks 2006 using Macros by Mike Spens, published way back in 2005. Like that book, Mr. Malpass’ new book is spiral bound. Mr. Malpass states in his introduction that he wrote his book to share his “ways of thinking and programming and hopefully to enlighten at least one other person’s day.” Much of the book is written in this same friendly manner. At times, the book is not written in a way that some would consider professional. Yet, he gets his points across clearly. The book is accessibly readable by experienced and novice programmers alike. The first chapter is correctly labelled “The Basics”. The first section gets right into the task at hand. The lesson teaches how to make and use recorded macros. The book next jumps right into writing macros from scratch. It takes a step by step approach that reveals what code is necessary. It explains each line in Mr. Malpass’ ever present friendly style. As one reads through the book, they will find code examples being built and explained piece by piece in both C# and VBA. These macros are real world examples that the reader may find immediately useful. Instructions are so clear that many will be able to apply the demonstrated code in their own macros. One good example of this is found in the first chapter. Right near the beginning of the book, Mr. Malpass provides instructions on how to make a macro that save each drawing sheet as an individual DXF File automatically. This example is great because this question actually comes up a lot in the online message forums. Many more important topics are extensively covered. These include working with selected objects, implementation of Property Manager Pages, traversing through each type of document, Custom Property Manager, working with drawings, use of forms, and how to create and use Add-ins (something of special interest to many). Additionally, all macro examples within the book are included in completed form on a CD. Of course, the book covers both C# and VBA code examples. However, it also often talks extensively about VB.NET. I found the instructions regarding VB.NET to be distracting, especially since few VB.NET examples appear in the book except for one section written specifically for it. Granted, VB.NET and VBA are very similar. However, in my opinion, differences are enough to warrant specific examples for each language. It should be noted that some VB.NET examples are provided on the CD. It seems to me that this book may have been better served if it focused on VB.NET and VBA instead of C# and VBA. C# may have been better handled within its own book. This would’ve allowed for more room in the book for more specific examples on even more topics, such as more information on how to read and utilize data from external files or methods specifically addressing the handling of BOM’s. That aside, my opinion is that this book is great for anyone with programming exposure and who wishes to learn how to apply that experience directly to SolidWorks. It is not meant for the person that has never attempted to program, unless that person is a brave soul willing to dive right in to the process. I believe this book will be useful for people from novices to those of advanced programming skill. 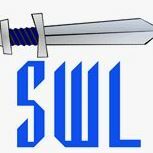 It may also be a good reference guide to professionally trained expert programmers for SolidWorks specific programming possibilities and requirements. I recommend this book. Disclaimer: This review is unsolicited by the book’s author. It is based on use of product that I purchased at full price. I receive no compensation for referrals. If you are interested in SolidWorks 2008 API Programming & Automation, it may be purchased here: AngelSix.com.